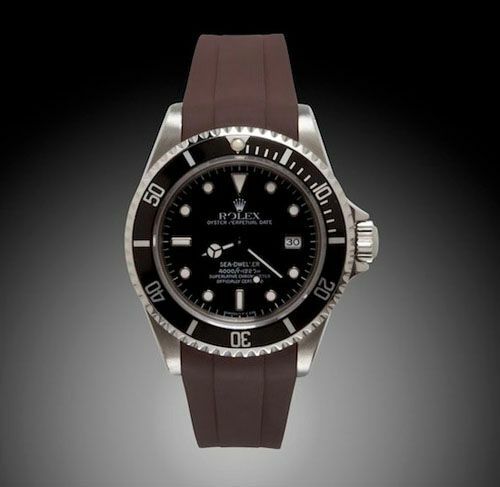 RUBBER B – a company located in Miami, Florida – introduced vulcanized rubber straps for a number of Rolex sports models. Their rubber straps will fit seamlessley to your Rolex Oyster case and the original Rolex clasp of the Oyster bracelet will fit without a problem. I came across these straps by reading Jake’s Rolex Blog where he covered RUBBER B straps already. Go over there to see some more pictures of the straps, including some close-ups of the strap attached to the original Rolex clasp. This rubber strap could be an excellent alternative if you don’t want to wear your Rolex with a bracelet while swimming, on the beach or just during summer. RUBBER B claims the straps to be of an impeccable quality, entirely manufacturerd in Switzerland. As you can see on the picture above, the strap fits perfectly to a Sea-Dweller (ref.16600) and since I have one of those, I would personally pick the brown one 🙂 There are also other colors to choose from, like black, white and blue. RUBBER B’s straps can be ordered through their website for $220.- USD a strap.